Granted, there have been a few fairly successful Multi-Level Marketing companies over the years but for the most part MLM companies succeed only at making the founders rich while filling participants’ garages with boxes of unsellable and sometimes unuseable products. 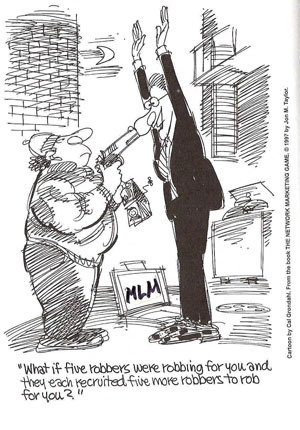 For this reason I despise MLM companies and have done quite a bit of research into them as well as other fraud-related business schemes. I really didn’t want to go to the “presentation” but since the new potential client was going to be at this meeting I decided I would go – for part of it. Boy am I glad I did! Not because I was convinced to throw away my hard-earned money for some magic pills (literally) but because I realized what a great blog entry that presentation would make! The presentation quickly began by introducing the new CEO that had been brought in as a “firecracker” to jump-start the company into success. The woman, easily in her late 50’s, had apparently made several MLM companies successful in the south (she was from South Carolina herself). And apparently only after a short time in this state she already knew everyone at every newspaper and TV station and had thousands of ideas to get the company’s name out. Her goal, she told us, was that by the end of July team Everest would have 5,000 members. Based upon the fact that only 35 people were in the room with me I kind of chuckled to myself, but the room was filled with applause and cheering after her announcement. But I laughed even harder when she announced that she firmly believed that by the end of August the company would have 10,000 members – and that by Christmas the company would have 50,000 members! Now this would be a lofty goal by any measure, but when she asked how many people were bringing 5 friends to the meeting on Saturday… not one person raised their hand. At that rate it’ll be Christmas 2017 before 50,000 join. The meat of the presentation was given by a younger and much more engaging woman who began by asking everyone to raise their hands if they had participated in a MLM company before – everyone except me raised their hands. She then asked how many had made money from their MLM company – not one hand was raised. It was at this point that I began to look around the room and the people seated with me. I just had to know what type of person, after having failed at three previous MLM companies, suddenly believed that the 4th time was the charm. What type of person tries again and again to make money from home without doing any work? The answer, suprisingly enough, was everyone! There were retired couples there, stay-at-home moms, and even legitimate businessmen that were trying to earn some money on the side. I slowly realized that the MLM companies had infiltrated every group of people available – and I soon learned that the key was finding the people within each group that really loved money and were easily convinced. At first, the fact that the company is trying to shy away from other MLMs that have stuck to one product (personal care, tupperware, kitchen tools, etc) sounds like an interesting concept. But in reality, their online store is nothing but a hodge-podge (yes, I said hodge-podge) of random products – similar to a drop-shipping site. So point #1 turns out to be not too interesting or unique. Even the woman giving the presentation admitted that the products in #2 “weren’t as popular” as the others – meaning that when you take the MLM spin off her statement it translates to “nobody buys this crap!” And #3 isn’t really an industry that they’re leveraging – it’s simply a statement of what they are. Team Everest is different from other MLMs because they renamed everything. Yup, that’s it. You know those “autoships” that everyone supposedly hates so much? Well at Team Everest they’ve eliminated autoships – but included something called MBAs which are exactly the same thing with a new name and a $99/mo price tag. Now at this point you’re probably thinking to yourself, “how did this guy stand to sit through all of this?” Well, it took a lot of self-restraint on my part not to walk out – but only because I was waiting for the next section of the presentation. The only real difference between the different levels was the discount you could get from the wholesale price of the products. For example, by signing up for the $599 program you could save 5% off the wholesale price – but in order to justify that from the $199 price you’d have to at least sell $8,000 of product! After hearing about the outrageous price the members were going to have to pay for the benefit of having a “genius” take their money, I couldn’t take it anymore and left. But I hope that through my experiences you might become more aware of MLM schemes, tactics, and methods. Most of all, I hope that you at least walk away with some sort of MLM radar in your mind so that when you friend or neighbor comes up to you with a “great and profitable business opportunity” that you will politely turn around and run away as fast as you can. If you’d like to learn more about MLMs including news and court rulings please visit http://www.mlmwatch.org/ which has some great MLM educational content. This entry of yours is a serendipitous find for me. Late I’ve seen people who are into MLM schemes – and who are subtly attempting to rope me to their cause. Frankly speaking, I don’t believe in any MLM schemes – because it benefits only the top echelon of the pyramid. The lower/deeper down the pyramid you are, the less you get. The founders, on the other hand, get the lion’s share of everything. Where’s the justice in that? It never ceases to amaze me how many bad mlm experiences are as a result of people simply not telling the (whole) truth. While I am not a fan of most MLM companies, I disagree with Wan (the above commenter) about MLM being a pyramid where only the top make money. There are no companies that pay an individual for everything that happens underneath them, thus giving everyone an opportunity to earn equal pay. Constructively… come say what needs to be changed. 1) This is a legitimate business opportunity where people can own their own online store with over 1800 products and more added weekly (including furniture, essential oils, gas pills, leather jackets, kitchenware, etc.) The prices are truly internet competitive. I have been selling on eBay and online for almost 10 years — and having a company who ships products for me, does the customer support, adds new products to my store for me, AND covers all of the merchant fees — well, this store opportunity is huge! 2) Anyone can own their store and never has to recruit anyone else into the company, and make a very good living by selling online. 3) The educational and self-improvement products available here are amazing — and The John Galt Society (TM) has recently been introduced into the company. 5) So, I would simply suggest, that instead of passing judgement based upon a jaded viewpoint (based on past history), you would realize that thousands and even millions of people make a living by selling products online — and Team Everest is a great opportunity for people looking to own their own business. I found your blog very amusing albeit full of stupidity and arrogance. It never ceases to amaze me how 2 people can be in the same room and hear/see things so differently. I was there to research an opportunity. You, it appears, were there to justify your being there. Iâ€™m guessing you think that people who network are fools, and people who sit through networking meetings are fools. So to justify the time you spent there you had to create value. The value you created was in thinking how you could portray this to others in as entertaining and demeaning a way as possible. Well congratulations I was entertained. Iâ€™ve chosen to take advantage of the opportunity since it is MUCH more than you make it out to be. Your pen name how fitting. Good luck Beancounter in your future endeavors. I, too, was at this Team Everest meeting, one of those 35 “suckers” in the audience. I’d like to echo some of Romay’s comments about BeanCounter’s lack of accuracy in reporting the event. I must admit that I got a chuckle out of some of his comments, mean-spirited as they were. Credibility is a funny thing and when he managed to not notice that the lobby, conference room, and all the offices were fully furnished, it must have been due to the dazzling reception that he received from the Team Everest’s founder, David M. Call. The fact that the furniture and decor is modern, sleek, and professional must have eluded him. Perhaps he was hoping for a big flowered couch. The new CEO of Team Everest is Patricia Sheranian and for some reason her age was an issue to the BeanCounter, although I’m not quite sure why considering her professional background. Yes, she’s from the South…but has lived in Utah for 20 years and is well known in the local business community, having figured prominently in the Provo-Orem Chamber of Commerce as well as serving in executive positions for a number of local companies. So you aren’t willing to sign up today. Ok. Funny thing is from what I’ve heard, Team Everest really was going to interview you about doing some work for them…but you apparently bailed on the opportunity. But hey…you got to write a nice post about it and that’s worth something, isn’t it? Oh, and in the interest of full disclosure, Patricia Sheranian is my mother. And while we don’t see eye to eye on everything, I do know how old she is, where she grew up and where she has worked. So… I just noticed one of the products listed; “gas pills”… are these like magic beans that will grow gas? Are they meant to give you gas? Or are they meant to relieve you of gas? If any of these, what kind of gas? Methane? Hexane? Oxygen? Carbon Dioxide? I too was at the same meeting as Jason the blogger and understood you Jason the blogger had been invited to the meeting to interview with the owner of the Team Everest company regarding a career position using your stated talents. I am sure having passed your blog along to the owner that the offer that would have gone to you has been withdrawn. Funny how life has a way of weeding out the weeds. Regarding the numbers you quoted and misquoted about future distributors coming into Team Everest you must have been the lucky go home early charm for the company, because since you were at the company it has tripled in size and is right on track for hitting those 50,000 member numbers. You may want to reconsider the publication of this post. After researching who you are (photos, resume, employers, home address, phone, etc.) and recognizing that you are an April 2006 graduate of BYU’s Accounting program and currently employed by BYU, I think you might have bitten off more than you can chew here. It’s one thing to have an opinion…it’s another to print a potentially libelous one. Upon reviewing your site I found that you have filed your entry about Team Everest in the Fraud section of this site and have tagged it with “fraud” with Technorati. A reasonable person would assume that you have labeled Team Everest as fraudulent. I hope that that is not your intent. There are many independent business owners like myself who represent Team Everest and don’t appreciate your unsubstantiated statements that could have a potentially damaging impact on our livlihoods. As of this moment, your attack piece on Team Everest places high on Google’s Blog Search results for the term “Team Everest.” Anyone seeking information about this company would be presented with your statements and opinions. And should they believe that you, a man with a degree in Accounting from one of the most respected Accounting programs in the nation, using his many years of business experience, had deemed that Team Everest was a fraud and choose not to do business with Team Everest because of your expert analysis, I believe that you would be liable for damages. Whether or not those damages could be proved in court and a finding of libel be rendered is up in the air. Yet there are other consequences to your somewhat reckless opining. A phone call here, a phone call there…after all, this is a VERY small town. At the very least I would expect that you would be embarrassed should the full list of your inaccuracies be made known. The solution is simple: Delete your entry and apologize for making the many mistakes in reporting the event that you did. If you still feel so motivated as to “warn” people about the risks that are associated with network marketing in general or go into further detail about facts that can be proven in relation to any specific companies, then sobeit. I feel bad that you would let Julie down so readily, without taking the time to do your homework. I saw you walk out and you were maybe there for only 30 minutes tops. Julie called me that day you came telling me that she knew of a wonderful person who she felt was qualified to fill the accounting position we were looking for. Also, she told me you had some web skills and since we were looking for somebody to help us revamp our website, we thought it would be an appropriate fit. You were a “guest” not as a prospective distributor but as a potential employee of the next multi-million dollar company in the industry. It’s interesting that you attack a company so easily without really taking the time to understand our business model, which is significantly different than the majority out there. However, whether you know it or not, network marketing is still the largest tax base in the state of Utah. Many excellent multi-million dollar companies like NuSkin, Synergy Worldwide, Xango, Nature’s Sunshine, Tahitian Noni, Usana, Young Living, Neways and others have provided a powerful opportunity for thousands of people to have a legitimate business opportunity and residual income while providing access to great (and in some cases life-changing) products. You are certainly entitled to your opinion but when you blatantly trash a legitimate company without spending more than a half hour in a meeting that you got “dragged” to, you end up selling yourself as a very shallow person indeed. I hope that when you step out into the cold, cruel business world you can be a little bit better judge of things and not pigeonhole anything or anyone too quickly. Doing so will only cause your peers to see you as a self-righteous know-it-all. I’m sure you know the type-nobody really likes to be around those people. Best of luck in your endeavors and next time please think before you attempt to libel a company and/or people you know nothing about. I found it interesting to read about one of the latest MLMs to pop up in Utah–the MLM capital of the world! I donâ€™t have any experience with Team Everest but the Beancounterâ€™s experience sounds like a typical MLM experience to me given what I know about MLMs in general. I teach a course on fraud and would recommend that those who want to get involved in Team Everest or any other MLM take time to learn how many MLMs keep from being considered illegal, fraudulent, pyramid schemes while some are eventually considered illegal. A great site to learn about MLMs is http://www.mlm-thetruth.com/index.html. Also, Kent Vâ€™s post about Mr. Call teaching philosophy at BYU leads me to some questions. I just searched for Dave Call on BYUâ€™s directory of faculty and students and found three entries for Dave or David Call but none are currently listed as faculty. I can only assume that Daveâ€™s â€œteam-teachingâ€ at BYU was temporary at best. Was he a guest lecturer or did he cover a class for someone who was sick? Was this a one-time assignment or is he scheduled to teach again? In any case, I want to reiterate that I donâ€™t know about Team Everest, its management or business model. I do know that a few MLMs pass rigorous criteria and are considered to have legitimate products and business models. The site I referenced above will tell you who has passed these tests. On the other hand, many MLMs have been found to reflect what Beancounter said he experienced. As such, I recommend that anyone interested in Team Everest or any other MLM consider the criteria found on http://www.mlm-thetruth.com/mlm_evaluations.htm for an assessment of how Team Everest stacks up against other MLMs and against illegal pyramid schemes. My wording of Mr. Call’s affiliation with BYU was purposeful as I couldn’t find him listed anywhere on BYU’s site either. Mr. Call told me that he had “team-taught” a class on Friday afternoons with a BYU professor whose name I don’t recall. I believe the class was during the just-completed Spring Term and that Mr. Call’s involvement was throughout the course of the term. Perhaps someone with precise information will fill us both in. On another note, I don’t believe that you intended to convey the thought that EVERY legitimate MLM has passed the referenced tests and is thusly listed on the referenced site. Please correct me if I’m wrong, but aren’t there companies that haven’t been tested yet that could be legitimate? You’re not stating that the list on the referenced site is comprehensive and all-inclusive are you? Your wording in your claim about Mr. Call team-teaching a class was that it was “a fact.” Unfortunately, we now know it is simply hearsay and we all need to find out what the facts really are. Unfortunately, there is a big difference between facts and hearsay. Please let us know next time before you make a claim based on unsubstantiated information. Also, I don”t think I said anything about a list on the http://www.mlm-thetruth.com/index.html site. Since you mentioned it though, MLMs are popping up left and right and the site’s list shows everyone they have evaluated and they say what the evaluation revealed–good and bad. It doesn’t look like they have specific information on their list regarding Team Everest. In my view, instead of the list, it’s the five criteria found at http://www.mlm-thetruth.com/mlm_evaluations.htm that are most useful and that I would encourage you and others to consider. I think the threats to sue for libel (or to make phone calls to, presumably, ruin Beancounter’s name in the small community) and hollow claims that Team Everest is legitimate could be eliminated if you and the others affiliated with this company would simply tell us how your business model stacks up to these criteria. Does the company pass the test or not? If not then the site’s research shows that someone who joins the company might just as well gamble at a craps table. If Team Everest does pass the test then Beancounter ought to acknowledge that this MLM is unusual and may be worth looking into. And as far as your comments about the referenced site, (“I do know that a few MLMs pass rigorous criteria and are considered to have legitimate products and business models. The site I referenced above will tell you who has passed these tests.”) it was written in such a manner that it could be interpreted that only those who were listed on the site were legitimate. I’m glad that we can agree that just because a company is not listed on the site as having passed their specific tests there is no reason to pass judgment either way as to that company’s legitimacy. I’m still a bit confused about your involvement in this issue. Are you involved in some way with the administration or publication of this website? Have you been retained by Jason Guthrie as a consultant in this matter? It is my belief that Jason had a bad experience while attending the Team Everest meeting and jumped to some erroneous conclusions about why he had been invited to attend. I believe that his entry was in part a retribution for what he perceived was a wrong that was perpetrated upon him by Team Everest or Julie Bagley or both. I further believe that he has engaged your assistance to help him defend his position and reduce any possible exposure he might have for listing his blog entry under his “fraud” category on this site. Now, these are my beliefs and my opinions and I’m making no claims that they can be substantiated. After all, isn’t that what blogs are for…opinions? It is nice to know that this company is so small time and its members so petty, that the they feel the need to defend the company so vociferously on a blog. And not only that, they like to throw around wanton threats and bully people expressing their first amendment right. This is not libel sir, In fact it is entirely legal, and any judge would laugh at you for trying to bring something like this to court. It was a well written post in which he shared his opinion of your company. And he is well within his rights to do so. I suggest you concern yourself with other things. Perhaps you should sell some gas pills, or read a few of your self help books. Multi Level Marketing. Psh. Kent, you’re an idiot. Just by continuously coming here and leaving comments it will push the popularity and reach of this blog entry further than it could have gone on its own, and will undoubtedly be near the top of Google for a query of your name and Team Everest for a very long time. I love how all these MLM sheep come in here and argue like Scientologists do whenever somebody actually calls them out. Go start a real business. Until you or someone else let’s readers of this blog know whether Team Everest passes the tests of a good MLM as outlined on the http://www.mlm-thetruth.com/index.html site, I believe many people will assume that there is something the company doesn’t want to publicize. Being listed on the site as a good MLM is not necessary as anyone involved in Team Everest should know enough about how it is organized to tell us whether it passes the tests. Why not address this issue so we all know? I’ll check back occasionally to see if anyone discloses whether Team Everest passes the muster or whether the dialogue continues to simply be entertainment without substance. Also, you have a great imagination when you ask about whether I’m involved in this website somehow. Are you kidding?! I know Jason as a former student but he has never asked me to do anything on his blog or website and certainly hasn’t retained me for any services whatsoever! Jason has never given me anything except for the assignments I asked him to do in my class! Finally, Iâ€™ve received two emails from Mr. David M. Call which claim he is the President and Founder of Team Everest. He has told me to retract my statements or I will be hearing from his attorneys soon. I want him and you to know that I am very comfortable in my comments as I have not said anything about whether Team Everest is legitimate or whether it is simply a pyramid scheme of some sort. All I have said is how a reader can learn about criteria for testing whether they should get involved in a particular MLM. I have also said that there are some legitimate MLM companies that pass the criteria Iâ€™ve pointed to. The criteria are simply a way to measure whoâ€™s pocket the money is likely to end up in. If Team Everest passes the tests of the criteria I point to then I will be the first to say they are a good company to be involved in. Until then, I am not passing judgment. Does anyone want to read Mr. Callâ€™s emails he sent me? Iâ€™ll be happy to post them. Kent, I forgot to mention that Mr. Call explained in his email to me the extent of what you called his “team-teaching” at BYU by saying: “I was invited to be a guest teacher (lecturer) this past Spring” and “As a matter of â€œFACTâ€ I also donated my time last spring (2005).” From Mr. Call’s explanation, I now believe that the reason he is not listed on BYU’s website as a teacher is because he was never employed by BYU. It sounds to me like he simply visited a class and lectured for part or all of the class. I think this is important to know given that some may associate Mr. Call with BYU if this isn’t clarified. I just couldn’t leave this alone…the mlm-thetruth site is a bunch of crap by a so called expert (SEE HACK) that doesn’t know anything about Network Marketing as an industry. There is not a single evaluation of any company on the gibberish “truth” site. It is simply a witch hunt by a clueless critic. Mr. Zimbelman; your follow-up comment was so tactful and perfect – I love it. I do find it amazing that these Team Everest employees continue posting here. My favorite is how they attempt to masquerade as innocent people attempting to uncover the truth that their company really is legitimate. I’m not sure about anyone else, but threats about lawsuits,potential stalking, and otherwise nefarious activities do nothing to clear a company’s name. I mean, wow. You guys are creepy; tracking down (and then advertising that you did so) place of residence, phone numbers, resumes, and the like – this makes you guys look like a 10 year old schoolyard bully, not a real company. For your reference, Team Everest. You state that the statements presented here are “opinion” (“Itâ€™s one thing to have an opinionâ€¦itâ€™s another to print a potentially libelous one.”). You will find it interesting to note that opinions cannot generally be considered libelous; “Statements of opinion are generally not actionable because such statements cannot be objectively characterized as true or false.” [269 Va. 569] and “the elements of libel are (1) publication of (2) an actionable statement with (3) the requisite intent.” [269 Va. 569]. You see, the statements here fail (2) and as such are not generally considered libel. Mark, I do like the FTC site and have written about it numerous occasions. The FTC provides excellent information. The truth site provides one sided crap, no different that the pitch artists described in this post. I pointed out to Mr. Call that I never called him a liar and a fraud but, rather, I simply questioned KENT’s assertion that Mr. Call was a teacher at BYU. As it turns out, according to Mr. Call’s email, he never was employed as a BYU teacher but, rather, donated time as a guest lecturer. I never heard Mr. Call claim he was a teacher at BYU but he sure appears to be sensitive to anyone challenging Kent’s description of him as such. Odd isn’t it? Very strange indeed Dr. Zimblemann. Mr. Call and his following is quite good at bullying and making threats. To that I say this: let’s go to the press and expose everything that has been said! How about we ‘get Gephart’ to investigate your company? I’m sure the public will be flocking to your MLM meetings after the lawsuit and “I know who you are and where you live” threats that Everest and their henchmen have made on an OPINION BLOG. Call can threaten all he wants, but Everest is not really the tall mountain of a company that is implied, but more like Team Titanic as it will soon sink as many other MLM’s have in the past. I think Nuveau Riche is a great company. It is involved in real estate education instead of lotions or juices. I guess it’s a borderline MLM but it’s a great deal better than pretty much every other MLM I’ve ever known. I’ve worked in a finance role at two major MLM companies. My experience is as a CPA, with plenty of auditing and corporate governance experience. Let me also preference my opinio by stating that I WOULD NEVER joing an MLM plan, I value my few friends and family too much to put them through it. However, I will say that the two companies that I have worked for in no way set out to commit fraud or deceive their distributors. I do believe they sold good products but at too high a price….but in my opinion, distributors shouldn’t be ignorant to that fact. Most should know that they pay a premium, but they do it with the hope/(or possibly delusion) that they will make a ton of money in the future….whatever, to each its own. I enjoyed your post thoroughly. Having been involved in a network marketing company in the past I can visualize what that meeting was like. Having said that, I believe that you see and hear what you want to see and hear. I am a fan of the multi level marketing model and think it is a great place to get business experience and possibly some extra income but I am frustrated with the way a lot of “mlmers” have tainted the industry by not being totally honest, making false claims, and focusing more on the recruiting of a downline rather than acquiring customers. I have created a short list on what to look for in a multi level marketing business opportunity at my blog to help people make informed decisions without jumping in too fast. 2. Find each individuals strengths – find the strengths in each member of your downline and help them build their business utilizing there strengths. 3. Lead, dont pressure – lleading is about ,successfully working the business so that your downline members will want to follow you on their own accord. Don’t add pressure. 4. Manage your time – view yourself as a businessperson, and keep each conversation on task. 5. Consistency is the key to success – create a list of simple business building tasks, and your members to keep a log of the tasks completed each day. Teach them that success depends on how many of these tasks they commit to completing on a consistent daily basis. 6. Maintain communication – send team updates or newsletters via email to your downline at least every two weeks. Recognize achievements as much as possible. 7. Know when to move on – you cant make anyone work. You can lead, but if one of your downline wont follow – it might be a better use of your time to find a more self-motivated person. I’ve never been in any MLM company meeting, but lately close friend has invited me to one (Nuskin). I’ve declined him more than once, however due to pressure and scrupulous me I decided to go, it will be tomorrow. through research about MLM, on my little research I found out a disturbing revelations. Whenever someone “attacks” the MLM companies their devotees immediately try to make him look like a fool, moreover the over-zealous of the MLM members and their lies regarding to their income, even to their closest friends, the way the speak about some very intelligent man who does not need to worry about money because he is so rich (yet he still works) reminded me of some cult’s organization I once watched on National Geographic, even when the cluties’ lifes were bitter they were too blind to see it, eventually they all died (mass suicides). Now that my all red lights are on, tomorrow in the meeting I’d cross fingers that they don’t use any kind of hypnosis because I’m not buying any bull****. Great website with a lot of valuable information on it. I love the cartoon.